A musical visionary who shares his reflections on mankind through his insightful, soulful songs, Dave Goodrich subtly lures his listeners into a greater awareness of the world and their place within it. He firmly rests his heartfelt melodic vocal offerings on a rock-solid bed of rhythm and drive to awaken his listeners to a better dream. He aims to change the world one beat at a time, while entertaining every audience he encounters along the way. Washington, DC-born singer/songwriter/producer Dave Goodrich performs extensively as a solo artist as he continues to write, record, and produce music. His latest guitar-driven rock single So Far from Hollywood (released on 21 June 2016 for digital download) celebrates the everyday hero. This new single follows on the heels of his 2015 single releases—Wrap Me in Your Christmas Love, his first original holiday recording, and You Are There, a soul-flavored love song. In 2014, Goodrich also released two singles, a soothing, hypnotic version of the traditional favorite Silent Night, and What's the Dark Matter?, a cosmic contemplation which merged the secrets of the universe with the concept of relationships. His solo discography also includes the acousto-centric Stripped Away, a ten-song homage to the bare essentials of life and the enduring power of love; the eclectic ten-song release 15 Minutes, which dances around the fires of fame and time; the spiritual 5-song EP Songs for You; and the eponymous 3-song recording Dave Goodrich. He currently has another full-length, fully-produced album in the works. A handful of the intelligently-crafted songs penned by Goodrich have woven their waves into more than 100 television shows—including MTV's MADE and The Oprah Winfrey Show—and have been licensed by companies such as Red Bull Media House. In addition to extensive placement on TV shows aired in the Americas, Europe, Africa, Asia, and Australia [Still waiting, Antarctica! :) ], Dave's recordings have received radio airplay on commercial, college, and internet stations and have charmed both listeners and reviewers alike. As a solo artist, Dave has performed in hundreds of venues such as Washington, DC's cool-edged 9:30 Club and the Manhattan landmark The Back Fence in Greenwich Village. Along the way, he has shared bills with many other gifted artists, including Jewel and Howie Day, and he has also performed some of his songs on television and as part of The No Rules Show, a theatrical talk show. Dave Goodrich's rock-based repertoire includes flavors of jazz, blues, and other popular genres, and his musical style sometimes reflects the indelible Latin influences from his days as a jungle- and volcano-exploring high school student in Mexico City. His rhythmic, percussive embellishments on the guitar reveal his history as a professional drummer. Playing the drums dominated Goodrich's early musical endeavors, and his mother's pots and pans served as his first "drumset." Besides the drums, he began studying piano with his mother at the age of four and wrote his first "melodies" for her to play for him. He also played the trumpet for awhile and started learning the guitar at around age twelve. Later, as a college student performing extensively in the San Francisco Bay area in such venues as the Berkeley Square, The Chi-Chi Club, and Mabuhay Gardens, he provided drum and vocal support to several different bands which covered the spectrum from alternative to country. Original recordings he produced were heavily aired on college stations throughout the Bay area. From 1985 to 1990, Dave Goodrich played in some of Washington, DC's top clubs—including The 9:30 Club, The Roxy, DC Space, and The Bayou—as part of the alternative pop trio Mind's i, for which he was a percussionist, singer, writer, and producer. The Mind's i album, A House Defiled—which was released on the BBTB label in 1988—was nominated for a Washington Area Music Award (WAMMIE) in the Best Debut Album category. His music career transition from behind the drumset to the front of the stage occurred following his departure from Mind's i and a subsequent short-lived break from musical performance. 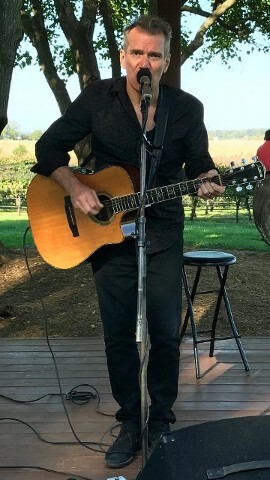 Although most of his current music performances are solo acoustic events, Goodrich occasionally performs with his latest group, The Dave Goodrich 3D Trio. As a frontman, Dave has created and performed with two other bands—various inceptions of the jazz-tinged duo/group The Blue Fire Project and the soul-infused rock quartet Dave Goodrich & the Soul Retrievers (which was originally called Dave Goodrich and His Band). A San Francisco State University music alumnus, Dave has been a voting member of The National Academy of Recording Arts & Sciences (The GRAMMYS). When he's not on stage or in the studio creating sound waves, Dave enjoys riding the waves at the Outer Banks. "It's easy to enjoy Dave Goodrich—all you need is a pair of ears and a soul to search."